CHICAGO â€” A vast, potent winter storm barreled across the nation's midsection Tuesday, depositing dangerous amounts of ice and snow before aiming for the winter-weary Northeast. "Enough already," said Steve Huang, 37, a Chicago stock analyst, as heavy snow began to fall here in midafternoon and strong winds sent it swirling across Michigan Avenue. "This feels like the worst winter ever." Not quite, but before the snow ends here this afternoon, total accumulation might flirt with the city's snowiest storm ever: 23 inches that fell Jan. 26-27, 1967. Thousands of airline flights were canceled as winter storm warnings flew from southwestern New Mexico to northern Maine, a distance of more than 2,300 miles. Life came to a standstill in a wide swath of the nation. Legislatures, schools and businesses closed, athletic events were postponed, and people stayed home. Chicago public schools called a snow day for the first time in 12 years. The city closed iconic Lake Shore Drive so crews could plow. Gingham's Homestyle Restaurant in St. Charles, Mo., is open 24 hours, even on holidays, but owner Craig Uttendorf closed the doors Tuesday afternoon. "It's been sleeting pretty good," he said, "and we've got a blizzard warning. We never close, but today is just not worth it." Blizzard warnings were in effect in nine states, from Oklahoma to Ohio. Meteorologist Mark Ressler of the Weather Channel said the system will move rapidly into Pennsylvania and parts of New England next. Severe thunderstorms that affected Louisiana and parts of Texas on Tuesday will shift into Alabama and the Florida Panhandle, he said. It's unusual for a storm to affect such a broad swath of the country and so many big cities, Ressler said. The Iowa Department of Transportation said most roadways in the state were partially or completely covered with ice and snow. Fatal wrecks were reported in Minnesota and Kansas. "If you don't have to travel, don't do it. If you can stay home, do it," Kansas Gov. Sam Brownback said. Ice coated Missouri and portions of Illinois, Indiana and Ohio. All of Interstate 70 in Missouri was closed between St. Louis and Kansas City. In Indiana, 850 members of the National Guard were activated and 26 shelters prepared. "There's only so much man can do to control Mother Nature, and ultimately Mother Nature will always win," First Sgt. Dave Bursten of the Indiana State Police said. Power failures caused by icing are a major concern. The storm caused about 18,000 Indiana customers to lose power, but electricity was restored to all but 8,500 customers, said Joe Wainscott of the state Department of Homeland Security. Road crews tried to keep up with heavy snow and ice while drivers confronted snowfall rates of 2-3 inches per hour in some areas. Jorma Duran of the Missouri Department of Transportation said it takes 100 to 200 pounds of salt to cover one lane for one mile during an average winter storm â€” and more in an ice storm. On Tuesday, the Missouri DOT doubled those normal rates. Cost per ton of salt: $60. The state is using 1,500 snow vehicles to cover 33,000 miles of roads in the next 48-72 hours. Ruddie's Quik Stop, a convenience store in El Reno, Okla., ran out of milk, eggs and bread Tuesday, owner Ruddie Leathers said. He wasn't sure when resupplies would be able to get through. "Usually we think 6 inches is a terrible storm," he said. "This is the kind of excitement I don't need." The blizzard halted production of today's Tulsa World, the first time in more than a century that the newspaper has not published. At the Blind Tiger restaurant in Topeka, general manager Mike Bowman said he plans to remain open even though a coating of ice slowed business "almost to a screeching stop" before it began to snow. Double-digit snowfall totals were expected. "I'm about tired of winter already," Bowman said. The winter of 2010-11 is only about half over, but many spots are enduring one of their worst seasons on record for snow and cold. Seven major winter storms have already battered much of the central and eastern USA the past six weeks, with no sign of any letup in the weeks ahead, according to The Weather Channel. Consider New York City, which has received 56.1 inches of snow, the National Weather Service said. That's more than five times the city's typical average of 11.1 inches, to date. This puts New York's winter in sixth place all-time. The snowiest winter season on record there was 1995-96, when 75.6 inches of snow fell. â€¢Tuesday's snowfall of 13.2 inches was the greatest one-day snowfall ever recorded in Tulsa, where records date to 1900. The 11 inches of snow that fell in just 12 hours in Oklahoma City was more than the city usually sees in an entire year. â€¢Wind chills in the Oklahoma Panhandle fell to 36 degrees below zero on Tuesday, the lowest ever recorded by the Oklahoma mesonet, a statewide network of meteorological sensors. â€¢Dallas/Fort Worth International Airport closed for several hours Tuesday, the first time in five years the airport shut down because of weather. Temperatures that plummeted into the teens in Dallas were the coldest the city has seen in 15 years, the weather service reported. â€¢So far this winter, Atlanta has received 5.9 inches of snow, which is more than four times the city's average of 1.3 inches. â€¢A total of 57 inches of snow fell in Hartford, Conn., in January, the city's snowiest month ever. Records in Hartford go back to 1905.
â€¢As of Tuesday, more than half of the contiguous USA (52%) was covered with snow, according to the weather service. The average for this time of year is about 45%. Only Alabama, Arkansas, Florida, Louisiana, Mississippi and South Carolina are completely without snow. In the city areas of Boston, there is now so much snow piled up that they have permission to start dumping in the waterways and sea. Piles at the sides of urban roads are now approaching 3 metres, so things are getting a bit desperate. I'm heading over to the big capital New York this coming weekend Saturday until Wednesday any ideas whats the weather is doing heared its cold? is it going to remain Cold? Current data plots for the US at 1800z and ten day forecast. If, a big if, the models are correct you won't need warmer clothes. Shawnee spent much of Wednesday digging out from a blizzard that dumped 9 to 12 inches of snow across the Kansas City metropolitan area. Businesses, civic buildings, libraries and even nearby Oak Park Mall shut down early Tuesday and announced they would open late the following day. Once the snow stopped falling â€” and, in some cases, even before â€” residents grabbed snow shovels and got to work on their driveways. City snow removal crews, who worked through the night scraping streets, continued their task. By Wednesday afternoon, the city seemed to be back in action. This week, with only a fraction of last weekâ€™s snow melted, forecasters were already calling for more. The National Weather Service predicted snow to begin after noon Tuesday, with between 1 and 3 inches accumulating by Wednesday morning. The Feb. 1 blizzard dumped 9 to 12 inches of snow across the Kansas City metropolitan area. Shawnee businesses, civic buildings, libraries and even nearby Oak Park Mall shut down early. Most announced they would open late the following day. Once the snow stopped falling â€” and, in some cases, even before â€” residents grabbed snow shovels and got to work on their driveways. City snow removal crews, who worked through the night scraping streets, continued their task. By the afternoon of Feb. 2, traffic was moving again and shopping center and restaurant parking lots were abuzz with customers who likely spent the past 24 hours cooped up in their homes. Schools, however, werenâ€™t back in business so fast. While roads were passable, bitter cold temperatures spurred Shawnee Mission and De Soto school district officials to cancel classes for Thursday, the third day in a row. Thursday-morning temperatures dipped to 9 degrees below zero at the Johnson County Executive Airport, National Weather Service meteorologists said. Farther south in the county, in Gardner, the temperature reached 14 below zero with a wind chill of 24 below zero. The National Weather Service Kansas City/Pleasant Hill, Mo., office said in a report on the blizzard that it was historic, in part, because of its expansiveness. The heaviest snowfall hit eastern Kansas, most of Missouri, Oklahoma and northern Illinois. Tuesdayâ€™s snowfall set new records in central Missouri â€” Warrensburg, for one, got 23 inches â€” but fell short of the all-time daily record snowfall for the Kansas City area. That record, recorded March 22 and March 23 of 1912, stands at 20.5 inches. A hundred degree 'warm up' for some areas in the U.S. this week!!! Just to addd that on the 10th Oklahoma recorded its coldest temperature in state history and records fell in cities in Missouri and Texas as a deep freeze gripped most of the nation. Nowata, Oklahoma in the northeast part of the state recorded -31F. The previous lowest temperature in state history in Oklahoma was -27F in 1930 and 1905, said Gary McManus, associate state climatologist with the Oklahoma Climatological Survey. As can be seen by todays 1800z chart dramatic changes can happen fairly quickly. As forecast I may add. 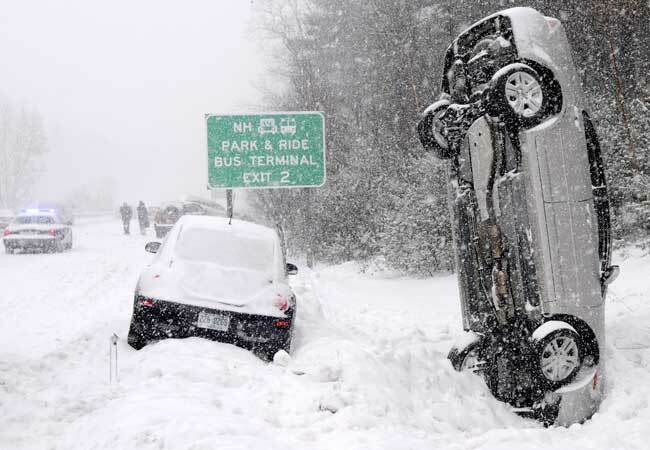 Stu Ostro's annual "Weather images of the year" blog! Nice page, but as soon as they mention somewhere outside North America they get it wrong! Then winter came -- early and with a vengeance in Europe. Much of the white in the UK in this satellite image is deep snow cover, and partially as a result of unusually persistent/cold winds blowing out of the east. That's Ireland, not the UK! looking at a bitterly cold end to Feb and begining of March here..daytime highs arent much above -20c right now and looks colder next week with highs not much above -30c going into March..quite signifcant windchill here the last couple of days to boot into the mid -30c....spring seems a long wat off!! How the hell do you function!? I suppose you just have to adapt and get on with it. I work for Lambeth out of hours and receive calls from tenants complaining about communal boilers going down and they can't cope without heating for one night, even with temps above freezing. People are too spoilt over here, I despair sometimes. Strangely i find it colder back home in england..here its a dry cold..not that bonechilling damp cold you get..give me -30c here than -5c at home anyday. Only when you get the windchill do you notice it..then it feels like bad pins and needles to your face and ears particularly. The good thing here is that everything is indoors..dont have high streets etc jus big malls and strip malls and the leisure facilties are excellent..so you dont have to walk anywhere outside to much in the winter. Strangely i find it colder back home in england..here its a dry cold..not that bone chilling damp cold you get..give me -30c here than -5c at home any day. The good thing here is that everything is indoors..dont have high streets etc jus big malls and strip malls and the leisure facilities are excellent..so you dont have to walk anywhere outside to much in the winter. I've never experienced temps that low so I'll have to take your word for it!! Opportunity for snow in San Francisco for the first time in 35 years. Just north of the bay area in the Mt Tamalpais park seems set for some snow fall, as the freezing level drops another 500ft today, with a possibility of snow falling at sea level. i have had quite a bit of snow over the weekend and it is still snowing and is fairly windy too. Right now its -26c winchill must be close to -40c, winter's going out with a bang here..although it looks like staying well below freezing for another 7-10 days...cant wait for spring now! On Friday, low pressure will make its way through Colorado. By Saturday it will be in Iowa and on Sunday it will be in Pennsylvania. Traveling almost 2,000 miles. Current Low: 4F - Montana, North Dakota and Minnesota. General distributon of temps at 00z.